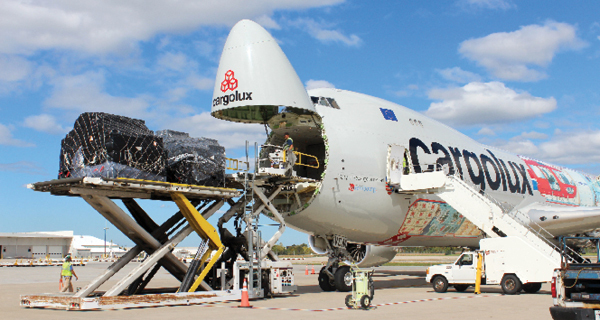 Rickenbacker International Airport, one of the world’s only cargo-focused airports, offers an uncongested option to move air cargo to, from, and within the United States. A crew at Rickenbacker International Airport in Columbus, Ohio, recently unloaded a 777 in just 90 minutes, says Christopher Dale, president and chief executive officer, USA, with Hellmann Worldwide Logistics. Once the plane was unloaded, the goods were trucked a mere 50 yards to a warehouse. “A plane lands and it’s immediately unloaded, versus waiting in queue,” he says. That’s not always the case at other airports, he adds. With the 2009 opening of the Heartland Corridor, the rail routing between the Port of Virginia and Chicago through the Norfolk Southern Rickenbacker Intermodal Terminal became incredibly efficient and increased freight capacity by allowing double-stacked intermodal trains to travel through the tunnels of the Appalachian Mountains. It also removed countless trucks from congested highways and saved transit times for customers. “The whole area is accessible by major freeways and rail systems,” Dale says. On top of that, Dale notes that roughly half the U.S. population is within a day’s drive of Rickenbacker. “It’s really well-placed, geographically,” says Dale. “For decades, it’s been a well-kept secret,” Dale says. “We see Rickenbacker as a better alternative to Chicago or New York for cargo, based on ease of use, user-friendliness, and lack of congestion when off-loading or loading a plane.” Hellmann has worked with Rickenbacker for about 25 years, he says. “One of the port’s greatest advantages is the collaboration across so many different parties,” says David Whitaker, vice president, business development with the Columbus Regional Airport Authority (CRAA), which operates Rickenbacker International Airport. “Our successes come from everybody rowing in the same direction.” This includes the businesses within the port, the organizations that help to run it and elected officials at all levels of government, he says. This year, Rickenbacker International Airport will handle about 100,000 metric tons of cargo, according to Whitaker. The majority of that will come from imports, although the export side is growing. The airport is cargo-dedicated, and handles a dozen scheduled international flights each week. It also hosts a passenger charter terminal with up to 17 flights each week. The military has a strong presence at the airport as well, Whitaker adds. Historically, the airport has been known for its ability to manage fashion imports. L Brands, the company behind Victoria’s Secret, PINK, Bath & Body Works, La Senza, and Henri Bendel, among others, is headquartered in Columbus. In addition to fashion, Rickenbacker International Airport has gained experience and expertise handling auto parts, electronics, and other products. Indeed, its auto parts operations are poised for growth, given Rickenbacker’s proximity to Honda’s manufacturing plant in Marysville, Ohio, as well as many other automobile manufacturing plants that dot the Midwest and Detroit. “We really like the auto parts sector, both import and export, and are focused on that as well,” Whitaker says. Along with many goods and products, Rickenbacker is a certified livestock exporter. It has moved horses, cows, goats, and even Harapan, a rare Sumatran rhinoceros. The rhino left the Cincinnati Zoo and flew via Rickenbacker aboard a Cathay Pacific Cargo freighter, bound for a Sumatran Rhino Sanctuary in Jakarta, Indonesia, to help increase the population of his species. To accomplish this goal, airport staff provide shippers, forwarders, and others with information about the market, the services available through Rickenbacker Inland Port, and the ways in which they can connect with carriers and efficiently move goods to and from the airport. That way they can provide the top-notch service their companies and customers are demanding at a reasonable cost. “Once companies use Columbus, most continue because it’s a very good experience,” Whitaker says. “No area is better situated geographically than Columbus in terms of reaching North American consumers quickly,” Whitaker says. Studies have shown that Columbus can claim the greatest access to the largest percentage of U.S. and Canadian consumers in the shortest amount of time. Rickenbacker Inland Port leverages this geographic advantage with a heavy focus on logistics across both public and private sectors, Whitaker says. Along with the shippers, forwarders, rail and trucking companies, and the airlines, numerous government agencies work diligently to continually develop the infrastructure that will enable companies to move their goods as efficiently and easily as possible. “The city, CRAA, and state and federal government support has been extremely helpful in continuing to make investments and improve the logistics infrastructure,” he adds. A case in point is the new air cargo terminal, which opened in May of 2016, and represents the combined efforts of multiple public and private entities. A private company built the building while several public agencies handled construction of the roadways, parking lots, utilities and ramp, among other features. The terminal currently offers 85,000 square feet of warehouse space and 15,000 square feet of office space, and can be expanded into a quarter-million square foot facility. This facility is just one of five air cargo terminals at the airport that, when combined, make up more than 600,000 square feet of terminal space. It is home to a large cross section of the logistics and supply chain industries, including airlines, freight forwarders, shippers, and a staffing agency. While each company has its own offices, the shared kitchenettes and conference rooms encourage collaboration, and the efficiencies and idea-sharing that can result. CRAA also manages Rickenbacker Global Logistics Park, part of a growing logistics complex that offers more than 68 million square feet of distribution space with room for expansion. Tenants have easy access to road, rail, and air transportation. “The cross section of capabilities make this a one-stop shop,” Whitaker says. Rickenbacker’s Foreign-Trade Zone (FTZ) #138 is another strong selling point for businesses to operate within the inland port. For the third consecutive year, FTZ #138 was ranked among the top 10 FTZs in the United States as measured by the value of goods moving through it. FTZ #138 is headquartered at Rickenbacker Inland Port and provides service to a 25-county area within central Ohio. Rickenbacker’s FTZ #138 is the top zone in the entire country for apparel and footwear entries, receiving an astounding 70% of goods entered into the U.S. FTZ program in that particular category of goods. An FTZ is a site within the United States that is considered outside Customs territory. That means some goods may be brought into the site duty-free and without formal Customs entry. Companies use FTZs to lower their costs and save time on Customs clearance, manufacturing, and re-export activities.”Companies can defer, reduce, or eliminate duties by being active in a foreign-trade zone,” Whitaker says. Companies working within FTZs also can consolidate entries of international shipments. (A Customs entry refers to information on imported or exported goods that’s provided on a duty entry form and submitted to Customs authorities.) Rather than record each shipment, companies operating within an FTZ can consolidate shipments and submit one weekly entry. “Consolidated entries can save significant amounts of money alone along with the benefits of duty deferral,” Whitaker says. The companies and organizations that try Rickenbacker tend to become long-time clients. For instance, executives received a call from a large chemical firm that was using a coastal port. “They called and said, ‘tell me about your inland port,'” Whitaker says. The airport and economic development professionals in the region began working with the company. “Today, they’re operating their largest warehousing distribution facility in the Rickenbacker area and are completely delighted with their success here,” he adds. Another key benefit is the lack of congestion. Rickenbacker International Airport offers fast, efficient operations. “We’re cargo-dedicated, provide great service, and enable cargo to move more quickly than other airports,” Whitaker says. The overall benefit of quality service, a focus on logistics, continued infrastructure investment, and a lack of congestion comes down to speed. “What you’re paying for when you buy air cargo is speed,” Whitaker says, noting that shippers, forwarders, and even customers pay a significant premium for air cargo. To recapture that investment, their goods need to move in a streamlined, efficient manner. “We think we’re pretty unparalleled in terms of moving goods quickly whether importing or exporting,” Whitaker says.